Summary: Meet Sally Sin. Wife. Mother. Retired Spy. Or so she thinks. After nine years with the USAWMD (United States Agency for Weapons of Mass Destruction)—where she desperately tried to stay one step ahead of her dashing nemesis, Ian Blackford—Sally has become Lucy Hamilton, stay-at-home mom to Theo and wife to adoring husband, Will, who knows nothing of her covert past. But now, instead of chasing bad guys through perilous jungles, she builds giant Lego towers, reads Green Eggs and Ham, and crafts exceptional forts from couch cushions and blankets. Just when she’s starting to settle into retirement, Sally’s old Agency boss, Simon Still, shows up to recruit her for one more job, involving the illegal arms dealer, Blackford, who is on the move again. Original Sin features Sally’s great chase to thwart Blackford, who, conveniently, no one besides her seems to be able to stop. But can she make it to preschool pickup, get dinner on the table, and foil Blackford’s nefarious plot? And just when you think the thrills are over, you’ll be ready To Sin Again. When the Agency Director is taken hostage, Sally is once again called into action. A rescue operation? Easy. That is, until Sally learns of a connection between the kidnapping and her own mysterious childhood, which complicates everything, even Theo’s kindergarten applications. Being a mom is hard enough, without having to save the world. 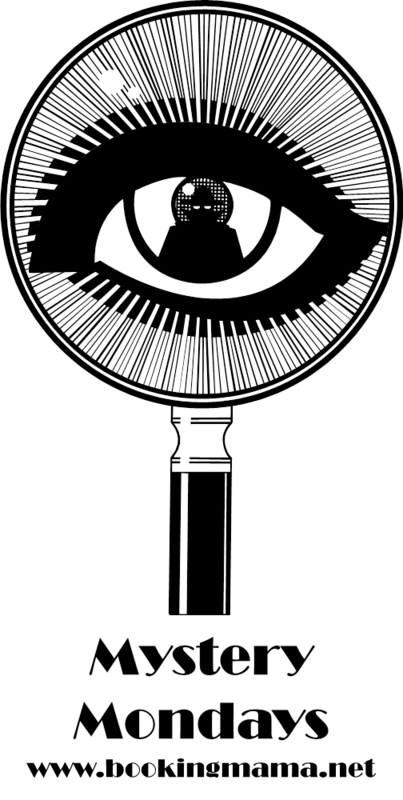 Recently, I've been reviewing some pretty "heavy" mysteries for Mystery Mondays, but not this week! 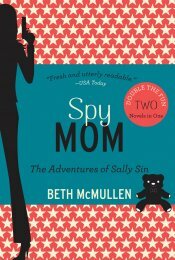 In fact, SPY MOM: THE ADVENTURES OF SALLY SIN by Beth McMullen is a fast-paced, but very fun, spy thriller that features a stay-at-home mom who is an ex-spy for a secret government agency. Unfortunately, she learns that she can't really leave behind her past career; and she becomes involved once again in the high stakes world of international spies and weapons of mass destruction. I totally had a blast reading SPY MOM and I adored Lucy Hamilton (aka Sally Sin!) What makes this book even more special is that it's actually two books in one! That's right -- SPY MOM contains two full-length mysteries, ORIGINAL SIN and TO SIN AGAIN. So it's double the fun and intrigue for the price of one trade paperback. In ORIGINAL SIN, Lucy is living a relatively normal life in San Francisco with her husband Will and young son Theo. She is devoted to both of them, yet has never revealed anything about her secret past. (I'm thinking that this could prove to bite her in the behind in later books.) 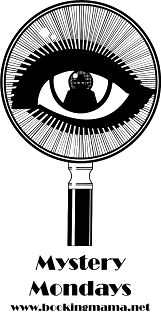 Lucy assumes that her dangerous past is behind her; however, when her secretive boss shows up and informs her that she can never totally walk away from the Agency, Lucy/Sally finds herself chasing down the elusive Blackford, an illegal arms dealer. Lucy/Sally's story picks up a few years later in TO SIN AGAIN. Lucy is grateful that her last mission is behind her but she fears that her son Theo might spill the beans about what happened. Still, she tries to keep her past from her husband Will. When the Agency Director is kidnapped by a long-time bad guy, Lucy/Sally is once again brought back into the Agency dealings. As Lucy/Sally tries to save the Director, she also begins to realize some hidden truths about her mysterious childhood as well as some new surprises for her current family. As I mentioned earlier, I thought SPY MOM was a hoot! I read the first book when I was at the beach and was very impressed with both the premise of the story as well as the tongue-in-cheek humor. I waited a few weeks to read the second book, and I was happy to find that I had the exact same reaction. Both of these books were extremely entertaining (for so many reasons), and I can't wait for the next installment of Sally Sin's adventures. One of my favorite things about SPY MOM was that it took a very fun (and also honest) look at being a stay-at-home mom. Granted, I never had the intrigue and danger that Lucy/Sally faced prior to having a kid, but I could relate to Lucy's frustrations and sometimes boredom with the tediousness of being a full-time mom. Lucy/Sally's personal rants were hilarious and I loved her social commentary about being a wife and mother. I found myself laughing quite a bit about her paranoia over the safety of her child's preschool (she spent the entire time in a coffee shop watching the single door to the school) as well as her jokes at the expense of her Prius and her husband's desire to live "green." And I thought much of Lucy/Sally's ideas about the pressures of keeping up with the neighbors was spot on. Another thing I really liked about SPY MOM was how the stories were told. While both books took place in the present day when Lucy/Sally is "just" a mom, there were numerous flashbacks to Lucy/Sally's past as a spy. As Lucy/Sally became more involved (albeit reluctantly) in the latest undercover operations, she would reminisce about her past and all of the dangers she faced. I thought it was a unique way to give information about not only Lucy/Sally, but also the secondary characters that were involved in the missions. I especially appreciated all of the history and "tension" she shared with Blackford! If you are looking for a hilarious and action-packed series (which also borders on chick/mom lit), then I definitely recommend SPY MOM! I got a good chuckle out of this. Sally Sin! Ha! I'd say most of us stay-at-homers would love a little intrigue and action (as long as it doesn't get in the way of feeding the hungry beasts, that is). But keeping past lives a secret from the family = trouble brewing. I think most stay at home moms have some spy skills - especially when their kids reach the teen years. This book sounds great and I love that it's actually two books in one! I agree this looks fun and moms definitely have some secret skills. I just finished reading a heavy literary work and am in the mood for something fun, and this book sounds like a winner!